Coincidence! I have a large bucket filled with Rudbeckia waiting to be arranged that I picked yesterday morning. They are a jolly welcome at your front door.All the other vases are lovely statements of summer too; you dinner guests must have been very impressed by such a welcome. 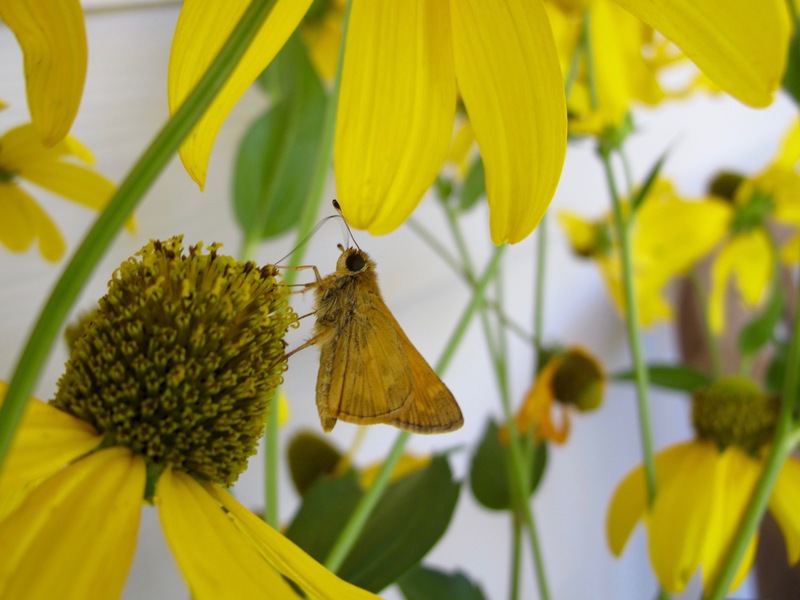 Rudbeckia celebration–it’s that time of summer. Christina, I won’t place them so close to the front door next time. Fortunately no one was too worried about being stung. Love the rudbeckia by the front door. Thanks, they’ve brightened up the front entry quite a bit. As hot as it is, there is nothing like the abundance of summer flowers! It’s amazing how some flowers can not only tolerate the heat, but even thrive. Nice to see you today. The rudbeckia’ look very welcoming, blue and yellow a winning combination. Thanks Brian. I like that rudbeckia more and more every year. 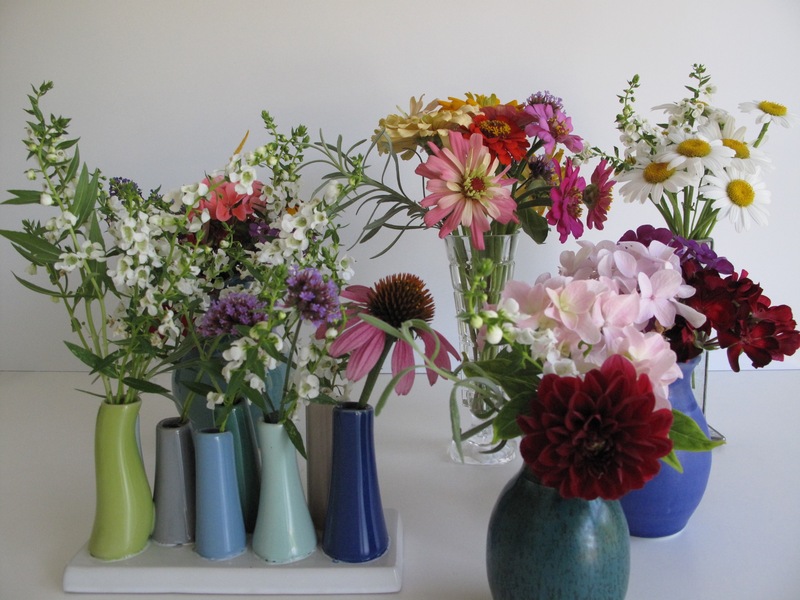 Love your small vase collection – what a treat for the eyes! I like the big, bold front porch arrangement, too. The blue vase contrasts well with the yellow, so pleasing. Thanks Eliza. Used to pick up little vases at local street fairs but haven’t done that lately. They’ve come in handy through the years. Love the house filled with flower vases. So much colour. I agree, there’s something special about fresh flowers inside. It’s fun to enjoy the abundance while we can. 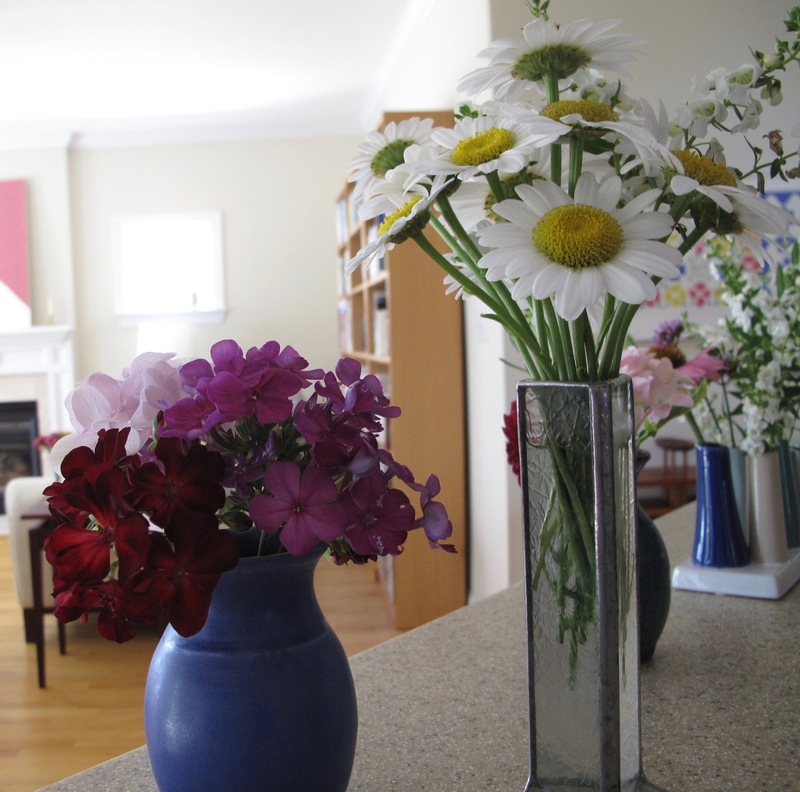 A generous host indeed…flowers outside and in. Lovely. Thanks Noelle. It was nice to be able to put those rudbeckias that I’d had to prune into that big pot for display. I love your Irish Eyes Cathy, but this rudbeckia is useful too. I do keep little posies around (and did even before your famous meme) for a constant bit of cheer. We can all use some. Oh my Susie your vases just are joyous singing summer all throughout your house. 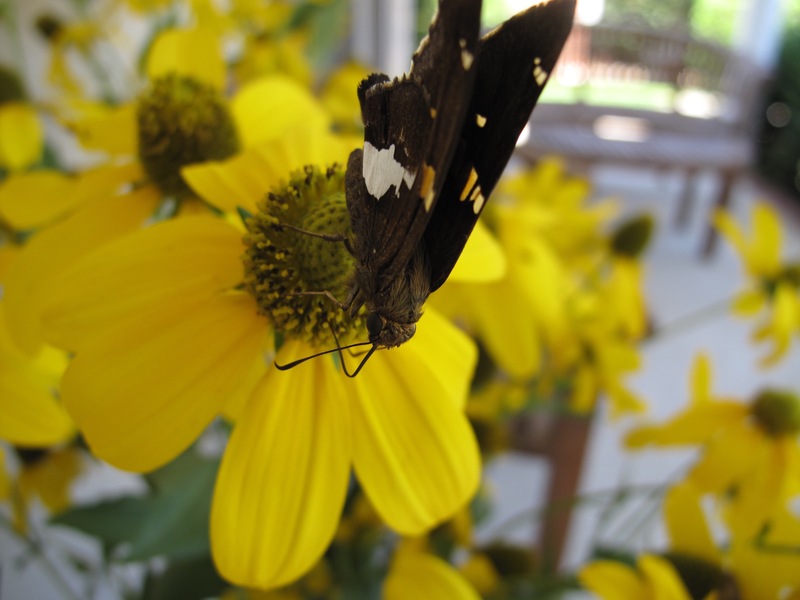 And then there is the urn at your door welcoming all…what a statement…and pollinators still visiting. 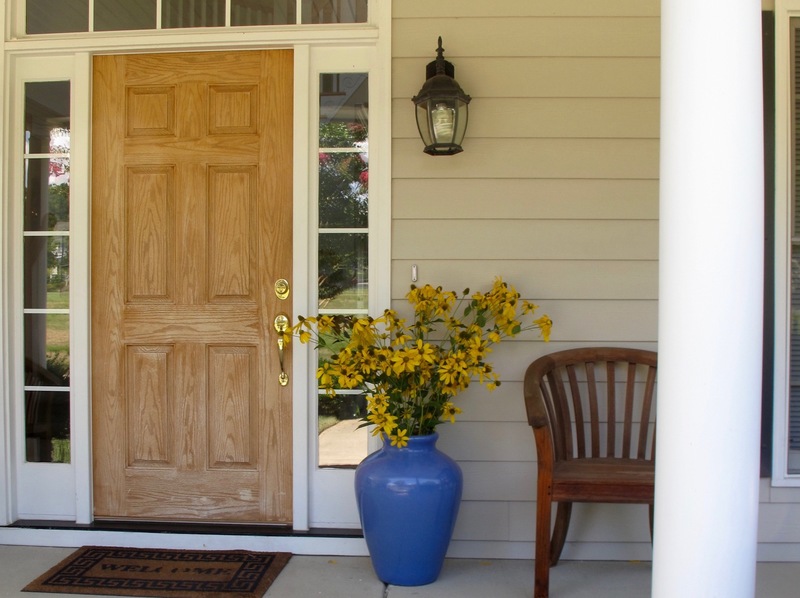 I love the idea of an urn next to the door and may borrow that idea if i can find the right vase. I have lots of heliopsis to cut down. My Rudbeckia laciniata is a hard worker too, but it hasn’t bloomed yet. Donna, the little flower vases do seem to sing of summer. Hope you find just the right urn for your door. The color of mine is more periwinkle than the photos suggest, and when I saw the pot I just had to have it. No regrets. What a wonderful welcome, Susie! 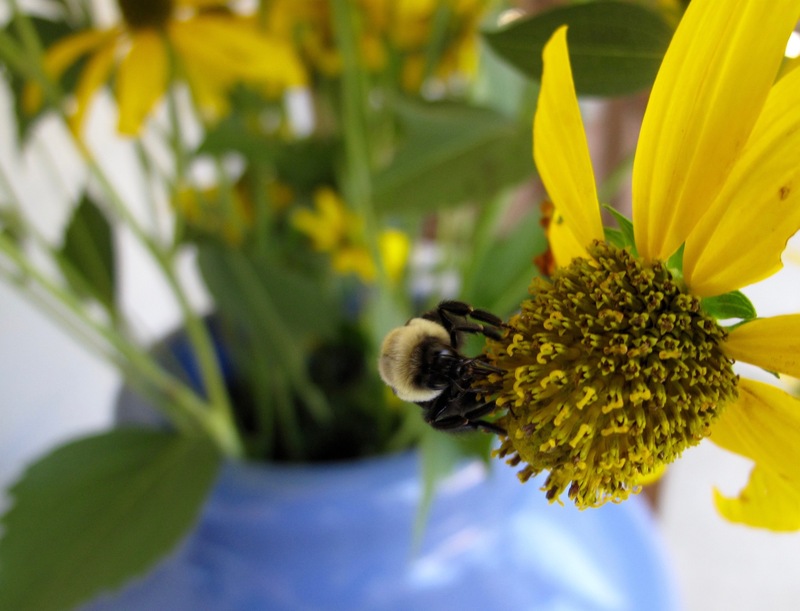 I found the urn with the Rudbeckia all the more delightful for the inclusion of the pollinators – as long as there are no wasps, bugs at the door are cool with me. Your assorted vases are all wonderful. I’m impressed by the range of flowers you’re able to gather from your garden this time of year. Thanks Kris. The no wasps rule is ok by me. The pollinators are attracted to that rudbeckia but I was surprised they were (and still are) so active after they’ve been cut. Some things just have one or two blooms left but I’d rather cut them and enjoy them inside rather than let them swelter in our 97-degree sun. Wonderful, so dramatic and cheerful. Thanks, it’s good to celebrate summer with flowers. Prunings are great when they work out like yours did! Are you growing Wallflowers? or what are the purple spikes in the small vases? Wondrous celebration of the prolificity of summer. Thanks. The purple spikes are Angelonia, sometimes known as Summer Snapdragon. It’s an annual that needs no deadheading, tolerates drought or rain, and will bloom until October’s first frost. OK, thanks, that grows here! Thanks Beth. We enjoy that front porch space often but I seldom add flowers there. It has been nice. 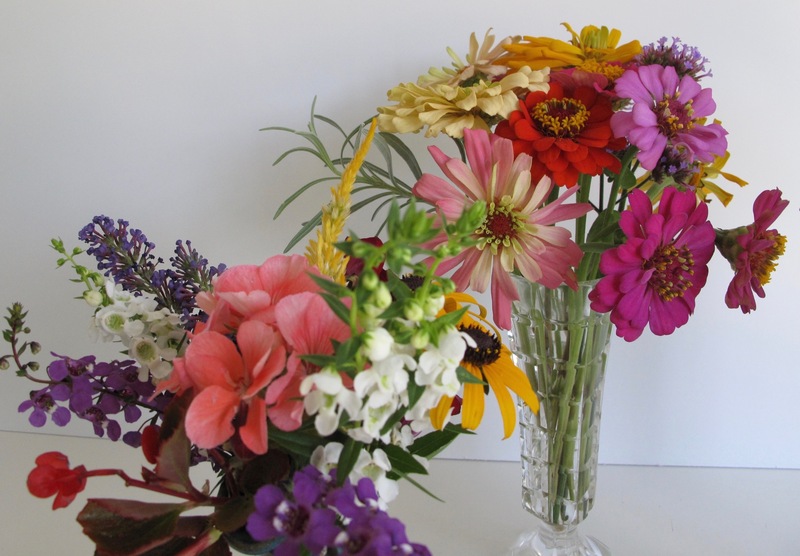 What gorgeous arrangements… the doorstep vase is quite something. Thanks very much. We’ve enjoyed having a colorful front entry the past couple of days. Do pop over Cathy! I’ll fill the house with flowers for your visit. Too bad this didn’t coincide with Thursday Doors. The pure white arrangement is my favorite! 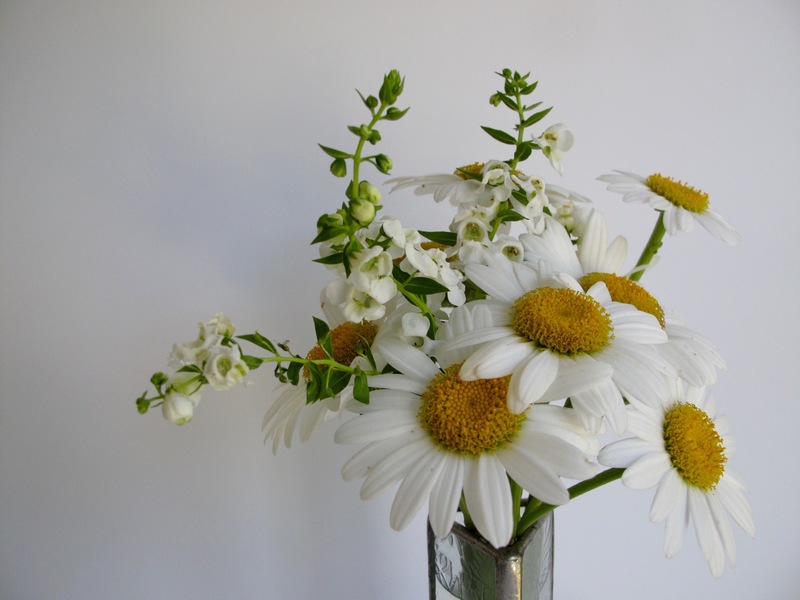 I love the daisies with the angelonia. The rudbeckia by the door also worked out very well. 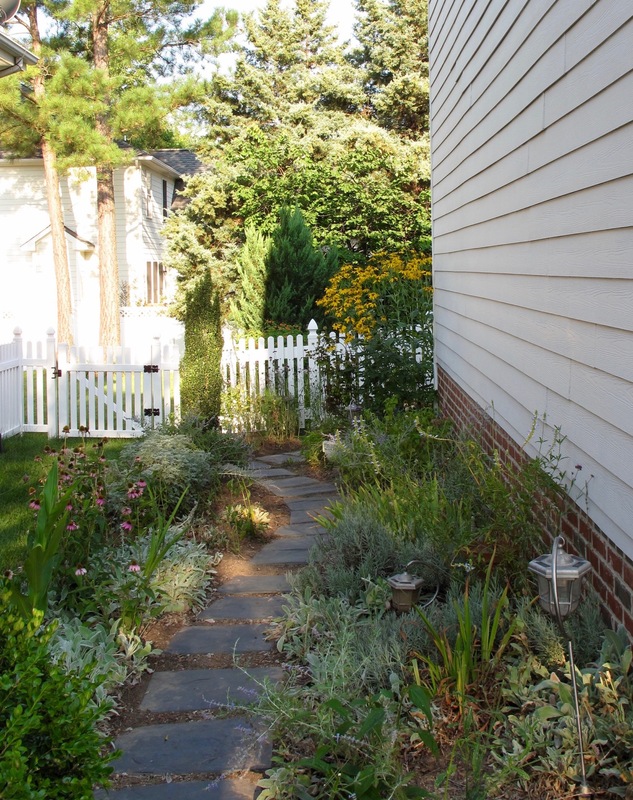 It sure does make a welcoming look as long as the bees aren’t too energetic and close! Thanks. I liked that white arrangement too. Even with all the wonderful summer color in the other vases, that one was my favorite. Reached across some echinacea while deadheading yesterday and got another bee sting. First time in years and now two stings. My fault both times but painful. Beautiful arrangements. 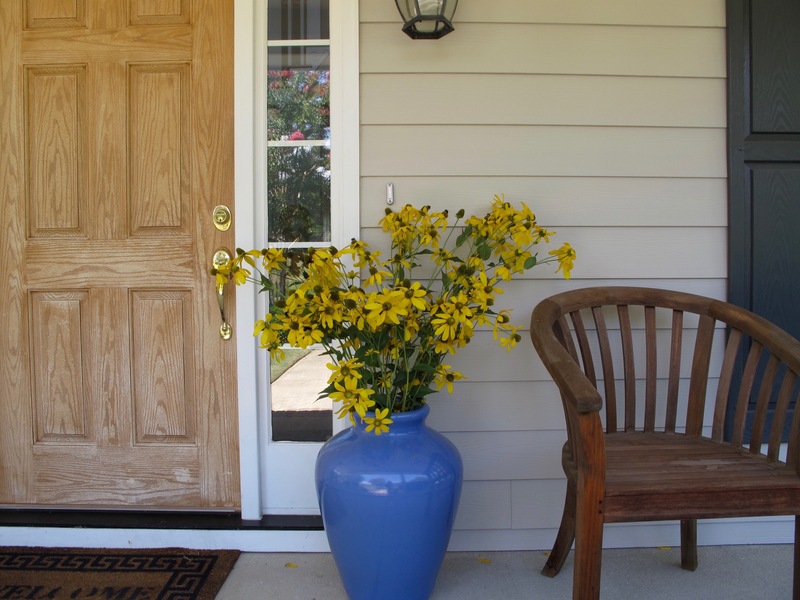 The colors of the Rudbeckia and vase by the door really are welcoming. To people and pollinators 🐝🐝beautiful indoor arrangements as well. My garden seems to be waning, but I may be inspired to try my hand at putting some in a vase and enjoying them.